Upon your arrival to Panama City, we pick you up and take you to your rainforest resort hotel. Located on the edge of Soberania National Park and Gatun Lake, choose from a relaxing day by the pool or take a birdwatching tour in the hotel reserve. Explore the wildlife of the forest canopy by aerial tram or visit Monkey Island. Optional tours included. Nature tour will give you the opportunity to see Howler Monkeys and white faced Capuchin. You might even spot a sloth, a few turtles, crocodiles and caiman. Free day to enjoy your resort hotel facilities including two pools, a full spa, nature trails and optional tours. Today we will pick you up and take you to Panama City for your short flight to David and Boquete. Located in Panama’s highlands and surrounded by lush cloud forest, Boquete is Panama’s center for activities, as well as sthe home of some great coffee. Spend the night at a local Finca – traditional coffee plantation. Explore Boquete together with your guide by visiting a coffee farm and the rock formations at Los Ladrillos. Coffee grown in this region is one of the best in the world. On the tour you will learn how coffee beans are harvested, the selection, drying, roasting and package processes. Take advantage of the free day. Relax and enjoy you hotel’s green gardens, take a hike, try a zipline or raft the rivers around Boquete. A short journey by land and boat takes you from Panama’s mountains to the white beaches of Bocas del Toro islands. This collection of islands are full of places to swim, surf, snorkel or explore the inland rivers and forests. Your boutique hotel is located on Colon, the largest of the Bocas islands. Today’s excitement begins with a trip to the Dolphin Bay, located a short boat ride away. Watch dolphins in their natural habitat at play. The beautiful mountains and mainland coasts here provide you great photo opportunities. The next stop on the trip is Crawl Cay where you can spend some time snorkeling and enjoy the colorful underwater beauty of Bocas del Toro. Enjoy fresh lunch and then visit the Red Frog Beach. The beach has an abundance of small red frogs – hence the name! Enjoy a day relaxing, or exploring the Bocas del Toro Islands. 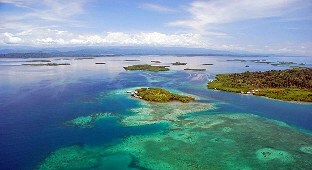 This Caribbean part of Panama is known for its excellent fish and relaxed atmosphere. For the more active, there are plenty of nature trails and activities for all ages. Return to Panama City on a short flight. There we will pick you up and take you to your city center hotel. Today you will travel away from the busy crowds of Panama City to the remote and untouched San Blas Islands. This island paradise is the home of the indigenous Kuna people, who have a unique way of life that has remained unchanged for hundreds of years. Travel by boat to your island lodge, located on a tiny Caribbean island – right over the water. Spend the evening watching the sunset and listening to the gently lapping water. Today you will travel from San Blas to Panama City. 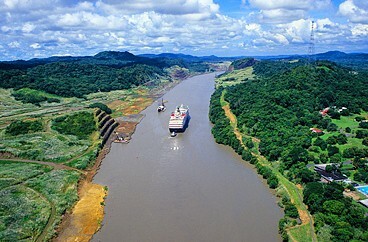 There you will be met and taken on a full tour of the city and the incredible Panama Canal. The tour begins with a stop at Miraflores, one of the best places to observe the traffic passing through The Panama Canal. At the nearby museum, your guide will explain the incredible history of the canal, and the stuggles involved in getting it built. Visit Amador Causeway before continuing to Casco Viejo; Panama City’s old quarter. Full of colonial houses, beautiful churches and winding narrow streets, your guide will take you to the main historic sites of the city before returning you to your hotel. We take you to the airport for your flight home. At Ideal South America we can take care of everything – including your international flights. All of our Panama tours are fully customized. Please contact us for a personalized tour itinerary.